from 20 to 24 February, Lucas-Nülle will be present at didacta in Hanover. We look forward to showing you the latest training concepts in Hall 13 Stand E43. Come and visit us and let us demonstrate our range of laboratory technology as well as our training systems in the main areas featured this year – Smart Factory, Smart Home, Smart Grid and Refrigeration & Air-conditioning. VOCANTO will feature too; for anyone who wants to experience modern Cloud learning. 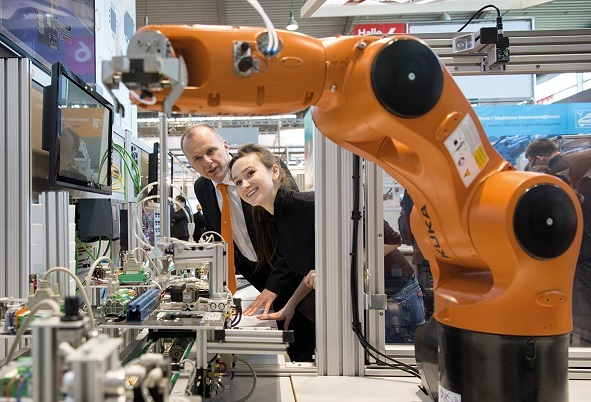 Unlike with industrial ERP solutions, training solutions from Lucas-Nülle allow students to learn programming and set-up without prolonged initial training. Compact and with a new design: the brochure on SCADA for Power Engeneering in the Smart Grid offers didactic solutions for training. At the end of 2017, Lucas-Nülle was one of the sponsors of the education and training conference held by the German motor trade. The name of the event signified its agenda: “AutoCareers: Starting out and progressing”.